PH Artichoke is a glare-free luminaire consisting of 72 "leaves", which shield the light source, redirect and reflect the light onto the underlying "leaves", resulting in distinct, unique lighting. 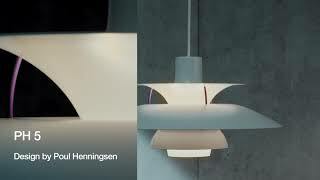 The PH Artichoke is considered to be a classical masterpiece, designed by Poul Henningsen, over 40 years ago. The structure is made of 12 steel arches, where 72 "leaves" in 12 circular rows are placed, with 6 blades in each row. Because each row is staggered from the previous, all 72 "leaves" are able to "cover for each other". Available in the following finishes: Copper, Stainless Steel or White - the frame is high lustre chrome plated, laser cut steel.